The highly vaunted, but meaningless, land management plans to save sage grouse are being put to the test with the recovery plan for the Soda Fire which burned 225,953 acres along highway 95 on the Oregon/Idaho border in August. Instead of focussing on reestablishing native vegetation, the recovery plan released last Friday calls for replanting 25% of the burned area with non-native Siberian wheatgrass, crested wheatgrass, alfalfa, and forage kochia. Ostensibly, these species are considered “desirable” non-native species but, once they are planted, they pretty much dominate the landscape for years into the future and increase the fire frequency over native grasses. The so-called “native” grasses that will be planted are cultivars that were selectively bred to be better livestock forage and don’t resemble their wild cousins. Similar recovery efforts for the Long Draw, that burned 557,648 acres in 2012, resulted in near monocultures of these deep rooted, tall stature, non-native livestock forage species that provide little, if any, value for wildlife (let alone sage grouse). It’s a return to the Vale Project of the 1960’s where the BLM plowed up the sagebrush, planted crested wheatgrass across the landscape, and built 2,100 miles of new fences to increase livestock grazing. Just like the Vale Project, there is only a 2-year cessation of livestock grazing with very vague criteria for resumption of grazing, no criteria to ensure the reestablishment of sagebrush – the primary food of sage grouse and pygmy rabbits – and no criteria for reestablishment of other vegetation that is sensitive to grazing. In pastures that were partially burned, 50 miles of new “temporary” fences (that usually end up being permanent) will be constructed so that cattle can continue to graze the portions that weren’t burned. Additionally, the 350 miles of fences that were damaged will be rebuilt, the BLM will plow up 200 feet strips on each side of the road to plant forage (prostrate) kochia as fuel breaks and, in places where junipers survived the fire, the BLM plans to kill them off. This isn’t a recovery plan designed to recover sage grouse habitat, it’s an expensive plan to quickly resume welfare ranching at a cost of $67.3 million. Rather than focussing on planting non-native livestock forage and quickly resuming grazing, the BLM should focus on reestablishing native vegetation and sagebrush for native wildlife. 15 Responses to Soda Fire Recovery, the First Test of New Sage-grouse Amendments, Already a Failure. This is thoroughly disgusting! There are no kinder words for it. says a lot about the two major land managing agencies that will spend hundreds of millions pouring money on fires with little effect, but has a pauper’s budget for purchasing native grass and shrub species. While incredibly expensive compared to non-native seed, natives are the obvious choice for accomplishing rehabilitation of the landscape. Is the BLM plan subject to public comments before implementation? I knew to expect that without a listing, a sage grouse/sage habitat conservation plan wouldn’t get top priority, but this is even worse than I could have ever imagined. At least Governors Mead and Sandoval seem to be taking this seriously (or am I wrong? ), but Utah is still crying. I will admit I’m not very knowledgeable about the sagebrush steppe plant communities, but after a quick read of the BLM recovery plan, it doesn’t appear the BLM is attempting to turn the Soda Fire into a “cattle forage zone”. For instance, within the Idaho burned area as stated in the recovery plan “Approximately 156,587 acres will be seeded with sagebrush species appropriate for the site and the forb seed mix”. Also as stated in recovery plan “The portion of the Soda fire that burned through Oregon generally burned at a low intensity”. On-site visits confirmed many islands of unburned vegetation were observed as well as partially burned sagebrush. Examination of the perennial grass showed little damage to the crowns and high likelihood of survival. As stated “Approximately 80,000 sagebrush seedlings will be planted on 1,500 acres within the burned area over the next three years”. Subsequently, only 3,850 acres will be seeded with a mix of native and non-native species and 365 acres will be seeded with a mix of native species. 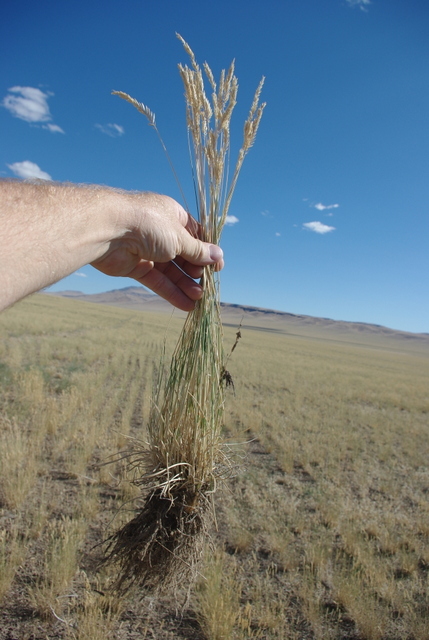 I don’t know the availability of native species seed within the sagebrush steppe ecosystem but in western Oregon, native grass species seed was extremely limited as there is not an economic advantage of producing it. Maybe Ken Cole can address that issue. Also, by seeding the area, noxious weeds will be deterred from establishment and although it would be optimal to seed with native species (availability? ), the establishment of native and non-native grasses will be far superior than the establishment of noxious weeds. As for the resumption of grazing, “The plan states “Provide adequate rest from livestock grazing to allow natural recovery of existing vegetation and successful establishment of seeded species within burned/ESR areas. 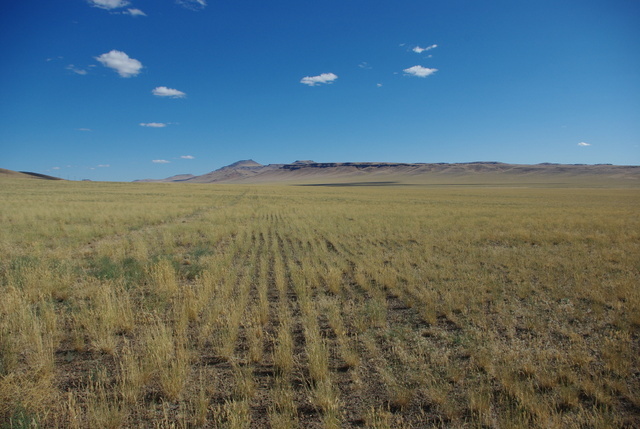 All new seedings of grasses and forbs should not be grazed until at least the end of the second growing season, and longer as needed to allow plants to mature and develop robust root systems which will stabilize the site, compete effectively against cheatgrass and other invasive annuals, and remain sustainable under long-term grazing management. Braun’s 2006 A Blueprint for Sage-grouse Conservation and Recovery recommends at least 3 years rest after a fire. I’ve never seen the BLM close an area for more than the 2 growing seasons so cattle could be on the landscape by October 2017. 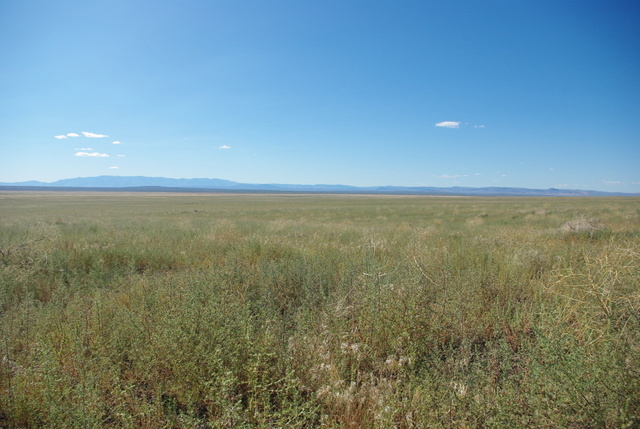 Others recommend 25 years of reduced or no grazing to ensure that sagebrush steppe ecosystems can be reestablished. And how does rebuilding fences, troughs and other livestock infrastructure help sage grouse? Fence collisions and West Nile virus are sage grouse killers. If BLM was serious about restoring sage grouse habitat they wouldn’t be planting Siberian wheatgrass and crested wheatgrass. Is this plan really about restoring public lands for wildlife effected (keeping in mind that wildfires use to rejuvenate lands in the past) or more about investing lots of tax payer dollars in propping up a tiny fraction of the livestock industry out here in the west? If you’ve taken the time to read the plan, millions and millions are going to be “invested/pumped into” addressing this issue over the coming years. Got wonder how did the land manage to come back in the past, for eons, after wildfires, without human intervention? And from the “plan” it looks like officials will be ridding the landscape of those “pesky” wild horses too. Those wild horses that number in the low hundreds (the claim is they have adverse effects on wildlife habitat) verses cattle, ranging in the thousands, on the same land? Agree with all 3 concerns Jessica although soil crusts suffer most in areas that are livestock grazed. Sage Grouse in Utah are doing better than a lot of us can remember in the last 10+ years. Its a good thing to see! Also after hunting upland birds for a better part of 15+ years, and putting hundreds of miles on foot and horseback I have come to the conclusion that weather impacts populations the most. Mainly spring and summer rains. a few years back when we had some dry summers/springs a lot of different upland species suffered. Its really amazing what a few well timed rain storms can do for a population. Thanks for the information about sage grouse in Utah. The rains had a huge influence here in Eastern Idaho as far as I’m concerned.